Anyone who has driven on the interstate between Chicago and Milwaukee will no doubt recognize this roadside sign, situated right off of I-94 in Kenosha, WI. For years I’ve always thought of it as an unofficial “Welcome to Wisconsin” – it’s a few miles north of the Illinois/Wisconsin border. Last June we decided to pull over and finally see what it was all about. We were also on a search for New Glarus beer which is only sold in Wisconsin. In 1947 Mario Ventura Sr. decided to open a cheese store alongside then-US 41, naming it Mars Cheese Castle. The name Mario is derived from the Roman god Mars – also his son’s nickname – and his mother had inherited a castle in Villa Roca, Italy. Over 60 years later, the family-operated store (currently managed by Mario’s grandson) is still going strong, attracting passersby to its new “castle” (built in 2011) with its great selections of meats, cheeses, and specialty grocery items. Oh, and yes…a large variety of New Glarus products! 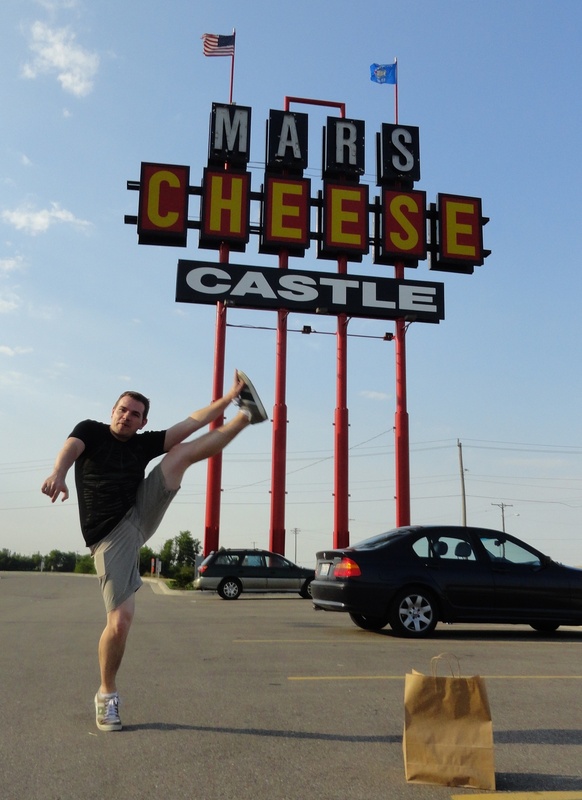 This entry was posted in High Kick Photos and tagged High Kick, Mars Cheese Castle, New Glarus. Bookmark the permalink.